Exhibition catalogue, Julio Galan, May 1996, New York, Annina Nosei Gallery, 1996 (illustrated in color). New York, Annina Nosei Gallery, Julio Galan, 1996. When he died suddenly at the age of 47, Julio Galán was unquestionably one of the most well-known Mexican artists in the world. Galán moved for several years to New York City in 1984, at the height of his success. A Neo-Expressionist, the artist's works boast a number of salient influences that were particularly significant during this period. He was influenced by other painters like David Salle, Julian Schnabel and Francesco Clemente, but also by the Baroque qualities of Latin American colonial painting, and by Mexican Surrealism and popular culture. Many of the prolific artist's works include self-portraits of the artist as a precocious child or young man. For this reason, many critics have discussed Galán's work in terms of a narcissistic homage to the self. Other themes that he frequently turned to included animal imagery and labyrinths. Filled with powerful, enigmatic, and vaguely disturbing imagery, Galán's work is the visual equivalent of the works of writers like Gabriel García Márquez, Julio Cortázar, and Jean Genet. 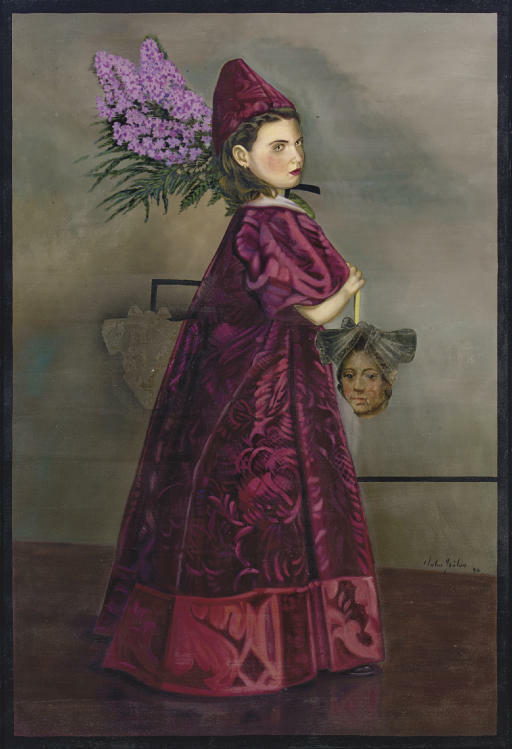 By the mid 1990s, the artist had become increasingly interested in depicting a heightened realism, concentrating on faces and still life elements in his large-scale portraits with a technique that borders on tromp l'oeil. This image is part of a series of paintings that the artist made of women, which were first shown at Annina Nosei Gallery in 1996. Theatrical and riveting, the series is an important and significant departure for the artist. Instead of a hermetic self-portrait, in this image, the artist presents us with a mysterious female figure. Part fairy and part witch, the enigmatic velvet-robed figure is burdened by two objects. The first is a large bouquet of purple blossoms, perhaps lilacs. The other burden, much heavier both physically and psychologically, is a double-ended object with a severed head hanging from either end. One head bears vaguely indigenous Mesoamerican features and its form is reminiscent of pre-Hispanic imagery; the other is a silhouette of the first with faint traces of features, a translucent reference to the original on the opposite side. The style in which the hanging head is painted is a reference to colonial painting--an aged, slightly faded and very realistic portrait. The mysterious figure carries her objects across a stage-like space, lost in reverie. Galán's first exhibition in New York was at Art Mart Gallery in 1985. After his success in Europe, he showed a several other New York Galleries, including Annina Nosei, Ramis Barquet and Robert Miller Gallery. His work was included in the 1995 edition of the Whitney Biennial and was the only Mexican artist to be included in the controversial exhibition Magiciens de la Terre at the Centre Pompidou. By the mid 1990s, his work was also included in blockbuster survey exhibitions of Latin American art, including the Museum of Modern Art's Latin American Art of the Twentieth Century. The Museum of Contemporary Art in Monterrey organized a traveling retrospective exhibition of his work in 1994 and another in 2007.